The hike to Eugenia Mine in Rocky Mountain National Park is short and easy, but best left for autumn after the crowds have left. The site of the mine is on the flanks of Longs Peak, but it is the summit of the Estes Cone that dominates the views. Carl Norwell, originally from Chicago, and his partner Edward Cudahy staked the Eugenia Mine in September 1905. The miners tunneled into the mountain more than 1,000 feet and installed cart tracks to haul gold ore. There’s no evidence a profit was ever made. The Rocky Mountain National Park Bill was made into law in 1915 and Norwell abandoned his claim in 1919. The entrance eventually collapsed and in the 1960s, the national park sealed the shaft. The hike to the mine begins at the Longs Peak Trailhead near the Longs Peak Ranger Station. Starting at an elevation of about 9,405 feet, hikers begin by following the well-traveled East Longs Peak Trail. From the Longs Peak Ranger Station the trail climbs steeply through a forest of lodgepole pine, spruce and fir. The trail soon levels off and about one-half mile from the trailhead, the Eugenia Mine Trail junction is reached. Turn right at this junction, as indicated by a small sign, to continue on towards the mine. At this point, the trail has climbed almost 275 feet, but the terrain heading towards the mine becomes much easier. Along the route, the trail crosses an old path up the mountain from Longs Peak Inn, built in the 1800s by Elkanah and Carlyle Lamb. Several other shallow pits dug by miners can also be seen. For another mile, the trail contours the hillside with short ups and downs. After crossing a footbridge over Inn Brook, about 1.4 miles from the trailhead, hikers reach the site of the historic Eugenia Mine along the eastern slopes of Battle Mountain. Just off trail are the remnants of an old homestead on a stone foundation, a rusted boiler and mine tailings. A sign on the site reads: “Eugenia Mine. At the turn of the century, produced more dreams than gold.” It is said that if the mine had been prosperous, there is a good chance the national park would never have been created. The remnants of the home at the site are where Norwell lived with his wife and two daughters while working the mine. Reports note that the family even had a piano. The trail continues on to Moore Park in another half of a mile and climbs to Storm Pass, eventually reaching Glacier Basin. The summit of Estes Cone require another 1.9 miles of hiking and another 1100 feet of elevation gain. 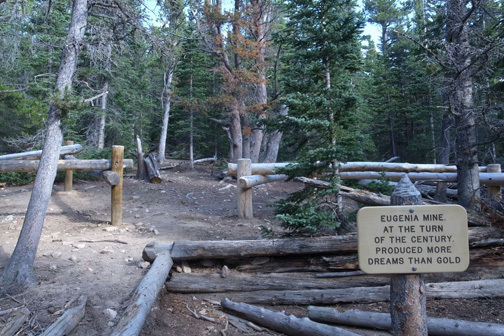 The Eugenia Mine is one of Rocky Mountain National Park’s historical landmarks, telling the story of those who attempted to strike it rich. Visit http://www.nps.gov/romo to learn more. Tags: Eugenia Mine, Rocky Mountain National Park. Bookmark the permalink.